The 2nd Earl of Strafford had it built to mark the way from the main road and perhaps away from Wentworth Woodhouse. 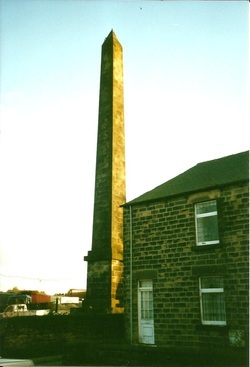 A date stone of 1813 is probably when the Rockley Engine House was built and a Newcomen type pump installed to keep the iron mine dry. The Gothick crenulations were designed to give it an ornamental appearance. The postcard of Rockley Engine House is incorrectly named, Rockey Abbey. Thomas Wentworth had bought the Rockley estate in 1723 and had a drive made to pass an old farmhouse rebuilt in an ecclesiastical style. It was called Rockley Abbey, but it no longer exists. The Queen Anne's Obelisk was erected 20 years after her death, by Thomas Wentworth on his Wentworth Castle estate. Queen Anne had honoured him with the title Earl of Strafford in 1711, but lost favour at court during the political turmoil after her death. The long inscriptions on the obelisk show Strafford's gratitude to the queen, and also his pride.